Do you LOVE eating out but HATE what it does to your waistline? Eating out regularly and/or having a heavy travel schedule doesn’t have to result in endless weight gain or health sabotaging foods. I’ve scoured the nation and found the healthiest items at every major sit-down restaurant, fast food joint or coffee shop. Discover the EXACT MENU ITEMS to keep you on track at over 30 different restaurants around the nation! No more guessing if what you ordered is healthy! Drink THIS not THAT at your favorite coffee shops! Certain drinks can add hundreds of hidden calories to your diet. Digital format so you can save it on your phone and refer to it while you are waiting in line to order! 100% FREE, no catch! It Works, but don’t take our word for it…. Thank you so much for sharing this amazing Restaurant guide. Eating out with friends and family has been a weekly routine for me and I found myself packing on the pounds because of this. Your guide is wonderful because it offers me healthy options with nutritional values for all the major fast food and dine-in restaurants. Oh, and the drink section is fabulous! I am a Starbucks fan and love McDonald’s McCafe Iced Mochas. This cheat sheet opened my eyes to the amount of sugar and calories in these drinks – yikes! – and I now make better choices. I’ve told all my friends to grab a copy of the guide to help with their journeys! I just want to express my love for this restaurant cheat sheet. I have lost 10 pounds in 1 month by choosing healthier food options from your sheet. Where I work we eat out everyday for lunch. It was taking a toll on my weight for sure. I downloaded your guide and love it. Recommend it to all! Beth Underhill is a wife, mother, entrepreneur, strength coach and lifelong advocate for women’s wellness. With over 20 years in the fitness industry, she has empowered women all over to “own their strong” in body, mind and spirit. Having successfully owned/operated several fitness boutiques, Beth currently runs the #OwnYourStrong Boot Camp, speaks across the country on topics related to cancer, self-esteem and body image, and is set to lauch the highly acclaimed ME vs ME Program for teens in schools nationwide. Beth’s FitLife Movement is gaining momentum with women as it is an environment where they can learn, share, connect and grow without the angst of judgement while overcoming issues with weight, food, body image, self-esteem and more by learning effective solutions in a supportive and nurturing community. 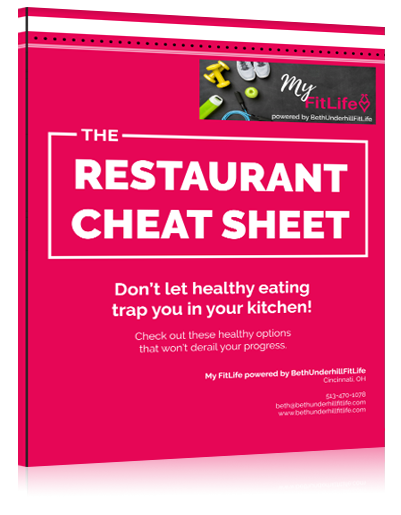 Get Your FREE Copy of the Restaurant Cheat Sheet, Subscribe Below!